So, you have a new digital camera. Maybe it's your first digital camera – maybe it isn't. But regardless of how new you are to photography, you probably purchased your shiny new digital camera in the hopes of getting better images. Well, the good news is, that new cameras tend to have newer, better sensors, which do have the capacity to improve the images you take. But, there's a lot more to photography than just the physical camera. Almost all digital cameras provide you with the means to shoot in 4 different shooting modes. These modes determine how to "expose" the image. Exposure has to do with how much light is allowed to reach your camera's sensor. Too much light and the image is too light; too little light and the image is too dark. So, exposing your image is critical to getting a good picture. Most cameras allow you to select a shooting mode with either a dial, button or menu. The dials and button to the right show how these dials or buttons may look, depending on which camera you have. This eTip explains these different modes along with their differences, attributes and drawbacks. The Shooting Modes are all about "Exposure", and there are 4 things that can be implemented or set to create the proper exposure. Light Generally this is fixed, especially if shooting outdoors. But, you can always add flash or other light (LED lights, light bulbs, use reflectors, etc.) to the scene. By adding light, you change the exposure. ISO Speed The ISO speed determines how much amplification is applied to the light reaching your camera's sensor. The light reaching the camera's sensor can be amplified to make it appear that there was more light than there really was. This is useful when shooting scenes with low ambient light. The ISO speed on your camera can be set to a fixed number (i.e., ISO 200) or can be set to "AUTO", which means that your camera sets it for you based on how much ambient light there is. Increasing the ISO speed often reduces image quality, especially at higher ISO speeds, so it is something you want to do consciously. Shutter Speed The shutter speed determines how LONG light is allowed to reach the sensor when you press the shutter button. Slower shutter speeds allow more light to reach the sensor than faster shutter speeds. Slower shutter speeds can also cause blurring of the image, as you have to hold the camera VERY still while the shutter is "open". You have to use a fast enough shutter speed to help prevent blurring. Faster shutter speeds can also help "stop" action – when shooting a moving object, a faster shutter speed can help "freeze" the object. Aperture (lens opening) The aperture allows more or less light to pass thru your lens. Each lens has a "maximum" aperture (f2.8, f4, f5.6, etc.). The smaller the number, the larger the aperture. Small numbers (i.e., f4) allow more light to pass thru the lens than larger numbers (i.e., f11). The aperture also affects the images "Depth of Field" – how much of a scene will appear to be in focus. This can be a photographer's most important consideration. Ignoring the semantics, the modes are listed in the same order – that is, Tv in Canon lingo is the same as S in most other cameras, etc. This eTip is all about these modes. In this mode, the camera makes ALL of the decisions. You rely on your camera to decide everything - your're prevented from changing any of its settings. The camera decides where, when and how to focus; it decides how light or dark the image should be; it decides when to use the flash; it decides what the colors should look like; if decides what ISO speed to use – it basically decides everything. This is inherently a bad thing, as your camera, regardless of how new or old it is or whether it cost $100 or $10,000, isn't always smart enough to do everything correctly – NO camera is. Your camera doesn't know how steady you can hold your camera; it doesn't know whether you want most of the scene to be sharp or if only the subject should be sharp. It doesn't know if you're shooting a moving or stationary object (although some cameras try to do this). If doesn't know if you're shooting outside or indoors. Some newer cameras try to determine what kind of scene you're shooting (portrait, landscape, sports, etc.) and then sets the camera settings accordingly - the problem with this is if it guesses wrong, your settings will be wrong. Your camera doesn't know all the things that you DO know. This is a good mode if you don't want to have to think about what you're doing, but don't expect consistently good pictures. Programmed mode can be the same as Auto mode, or it can be different. Let me clarify. In "Auto" mode, the camera decides everything and you get to decide nothing. In Program mode, if you don't change any of the "default" camera settings in the menus, then Program mode is basically the same as "Auto" mode. Program mode does allow you to change the default settings, which is why it can be much better than AUTO mode. You can change the "default" from "AUTO-ISO" (where the camera decides what ISO speed to use) to set the ISO speed to whatever you think it should be. You can shoot RAW images with most cameras, something you can't do in AUTO mode. You can set the white balance, to compensate for a cloudy sky. You can decide when to use the flash – something you can't do in AUTO mode. When shooting "people" pictures in sunlight, it's generally a good idea to use flash – something you can't control in AUTO mode. There are MANY options you can use in Programmed Mode. These options allow you to use your camera the way it was intended to be used. But, Programmed Mode still doesn't provide the flexibility that most photographers want. 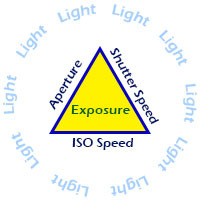 Aperture Priority Mode (A on most cameras; Av on Canon) is an automatic exposure mode where you set the lens' aperture and the camera determines what shutter speed to use, based on the ISO speed and the light on the subject. It is the most commonly used mode by people who take good pictures. Why can you take better pictures in Aperture Priority mode than the other modes? It has to do with controlling Depth of Field (set our eTip on Depth of Field here). When you take a picture, you, or your camera, focuses on a subject. Depending on several factors, the most significant being the lens aperture, more or less will appear to be in focus in front and behind your subject. When taking a portrait, you generally don't want a lot to be in focus in front of and behind your subject, as that will distract from your subject. You can select a wide aperture (small f-number) when shooting a portrait so the background will be blurred or you can select a small aperture (larger f-number) when shooting a landscape so more will be in focus. This allows YOU to control what your final image will look like. Aperture Priority Mode works best when you're photographing a subject that is relatively stationary and when you want to control the depth of field – this describes most images. The problem with using Aperture Priority Mode is that you could select an aperture that is small (larger f-number) and the camera is going to select a slow shutter speed. That shutter speed may be too slow, and cause you to get a blurred image (see our eTip on avoiding blurry images here). So, you have to be aware of what shutter speed your camera selects and be sure that you can hand-hold your camera (if not using a tripod) at that shutter speed without blurring the image. Shutter priority mode (S on most cameras; Tv on Canon) is an automatic exposure mode, but in this mode, you set the shutter speed, and the camera determines what aperture to use based on the ISO speed and the light on the subject. You lose the ability to control depth of field, but gain the ability to use faster shutter speeds when necessary – such as when shooting fast-moving objects. When shooting sports, Shutter Priority is often the preferred mode. You can also gain the ability to use a SLOW shutter speed, so you can purposely blur your subject. 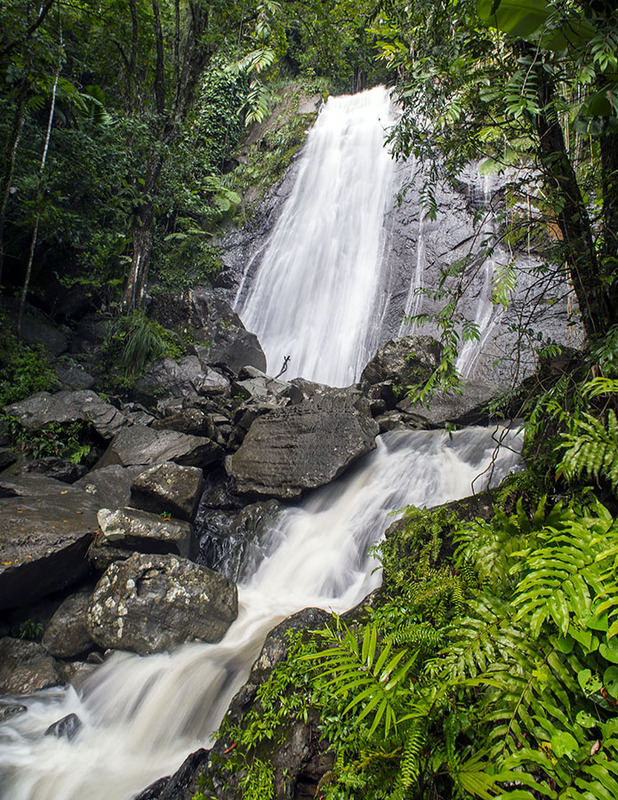 For example when shooting a waterfall, it's always a good idea to use a slow shutter speed so the moving water blurs - you also want to use a tripod so the background doesn't blur! But, there is a distinct limitation using Shutter Priority Mode. When selecting a fast shutter speed (e.g., 1/2000 second), your camera may need to select a very wide lens opening (e.g., f2.8). All lenses have a maximum f-stop – professional lenses often have a maximum aperture of f2.8 whereas consumer lenses often have maximum aperture of f4 or f5.6. 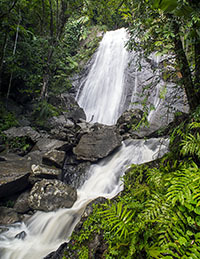 If your camera determines you need to shoot at f2.8, but your lens only has a maximum aperture of f5.6, the image will come out very underexposed – too dark. So, you have to be aware of what aperture your camera is trying to select and make sure that your lens can support that aperture. Unless you have a specific reason for shooting in Manual mode, you should probably avoid it. One time where manual mode may be useful is when shooting long exposures – e.g. more than 30 seconds. It can also be used when shooting portraits in a studio where you would measure the ambient light using either a gray card or an incident light meter. These modes are great to use as they will set many of the camera options the way they should be set for a specific type of photography. However, selecting one of these scene modes usually prohibits you from changing certain settings. For example, if you select "Portrait" scene mode, the camera may pop-up the flash automatically, whether you want it or not.